Did you know that you could go brain dead even within a few minutes of oxygen deprivation? 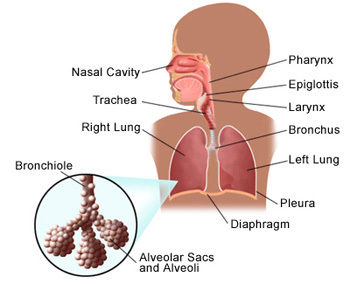 The respiratory system is the one involved in breathing and supplying oxygen to the body. The primary organ is the lungs. The two lungs expire and inspire to keep a constant supply of oxygen in the body. You can survive for several weeks without food and several days without water, but only less than 7 minutes without oxygen. Respiration is important for your cells to perform their functions properly. Through inhalation and exhalation, the lungs excrete carbon dioxide and take in oxygen. Due to atmospheric pressure, oxygen goes into the lungs due to the lower concentration of oxygen inside, while carbon dioxide goes out because of the low concentration of carbon dioxide outside the body. It helps maintain acid-base balance by increasing and decreasing excretion of carbon dioxide when the body needs either more acidity or less acidity. This would help the kidneys in maintaining the normal blood pH (acidity and alkalinity of blood) at 7.35 to 7.45. Provides oxygen to all parts of the body for proper cell respiration. With proper respiration, the cells could perform their physiologic functions properly. You breathe in through your nose. This is an appropriate opening for proper breathing. The two nasal openings are composed of cilia, which prevent the entry of foreign substances, dirt and dust. The air passes through the trachea, where a sphincter opens when we breathe and another sphincter when we swallow food. This is composed of alveoli, which are the functional units of the lungs. The autonomic nervous system controls our inhalation and exhalation. Together with the internal, external intercostals, latissimus dorsi, sternocleidomastoid muscles, the lungs perform their functions to make the body survive. These are small braches of airways where oxygen enters the lungs. It is composed of cilia and at the ends of it are alveoli. This is where gas exchange takes place between carbon dioxide and oxygen. Phospholipid allows the lungs to collapse and expand to provide continuous supply of oxygen to the body. Without the phospholipid, the lungs cannot return to their original shape. Just like the bronchioles, it is composed of epithelium. This is characterized by high fever, coughing, difficulty in breathing, and body malaise. The causative agent may be bacterial. If treated during the early symptoms of the disease, it offers higher chances of good prognosis. You can get infected with this condition if you are exposed to the bacteria. This is usually genetically-linked and can be initiated by stress, a substance you are allergic to or suffocating atmosphere. Characterized by a hoarse, dry cough, fever and body malaise, this condition is bacterial in nature. The causative agent is Bordetella pertussis. If treated earlier, the patient will recover more quickly. The droplets coming from the cough may contain Bordetella and are, therefore, infectious.